I guess those excellent wooden doors weren’t staying shut, so the spool was put into service as a door stop; those Nebraskans are resourceful like that. 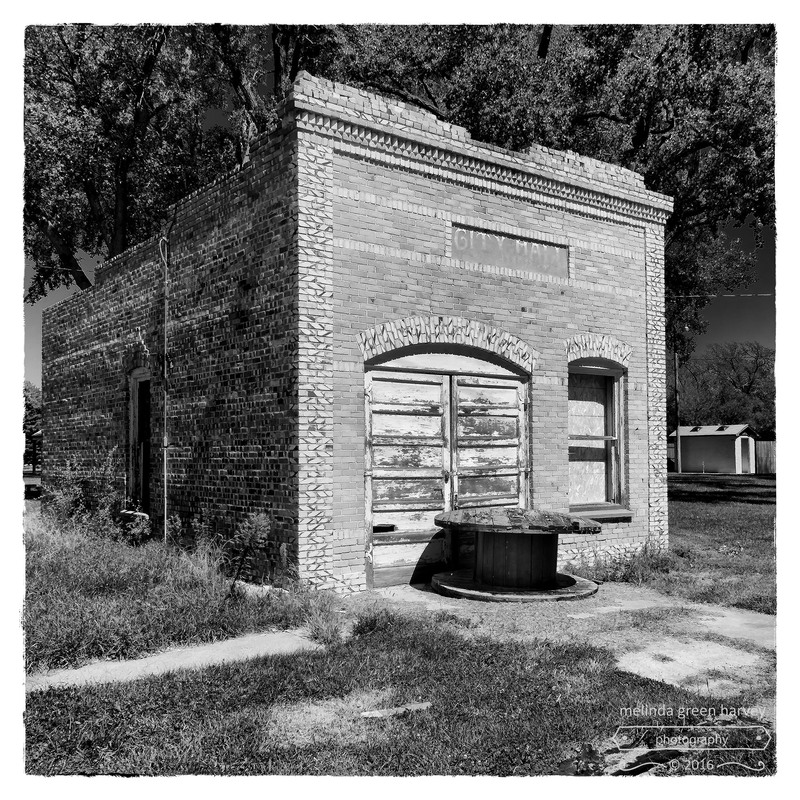 Posted on November 23, 2016, in Photography and tagged 365 photo project, abandoned buildings, architecture, black and white photography, melinda green harvey, monochrome, nebraska, NIK Silver Efex Pro 2, one day one image, photo a day, photography, postaday, Rockville Nebraska. Bookmark the permalink. 8 Comments. What character the building has. What characters entered there. Much more than the public bathroom (?) in the background. Guess those Nebraskans know a thing or two about resourcefulness. This same town had a bar called The Dam Bar. That’s sort of resourceful, too, right? I like how they used those bricks with the diagonal in the glaze/finish. I wonder if those are kiln-accidents from the spacers they sit on during firing that some resourceful bricklayer set aside as accent pieces. I don’t know what makes those diagonal lines in the bricks. Putting them in on purpose doesn’t make too much sense to me. But neither does having that many accidentally marked ones. One of us should research that, and let me know. I have a lot of wood-fired pottery and it has the marks from the little tripods used for stacking in the kiln, as well as differential exposure to flames and heat during firing. I can imagine that bricks were stacked with spacers to allow the heat to circulate and that these spacers would leave their marks. I can also imagine the average bricklayer turning those marks inwards so as not to catch sh!t from the foreman, or architect. As to research, there is lots of stuff about brick. I have delved there before when excavating Roman bricks, or medieval bricks in London, as well as some of the locally early bricks here in British Columbia. So, that deal on the brick in the link is a “good luck sign”? The next time you’re in central Nebraska, you should stop by this place to examine the bricks in more detail. They’re not Roman or medieval, as far as I know, but I’ll defer to your expert opinion. These days they call it alt-luck.